PHP is a programming language for the creation of websites and high-load web applications. The largest resources written in PHP are Facebook, VK and Wikipedia. The creation, updating and maintenance of PHP sites has been carried out by EDISON specialists on many occasions. With the help of PHP, developers can quickly and easily create and service web applications, develop highly configurable html pages, support websites&apos; server sides, and integrate web applications with other software products. Due to the popularity of the language, PHP programmers are in high demand. Nevertheless, PHP is easy to learn and some self-taught programmers even consider themselves specialists, the lack of any practical experience in using the language notwithstanding. Redesign and update of an online shop for household appliances with a selection of more than 700,000 items (including archived products). The information is replicated from the database of an internal product management system. 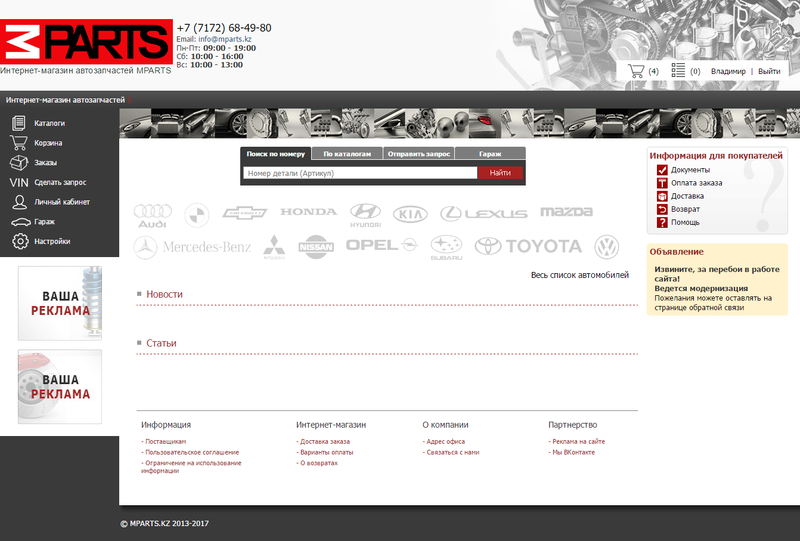 Integration with Yandex.Market and parsing of customer comments from the site. Automatic generation of a site map. Update of an information portal for publishing news about China, Russian–Chinese cooperation, advice for students of the Chinese language, interviews and other related content. Added a Chinese version of the site. Improved the inbuilt Russian–Chinese translator. Update of a website for searching for and booking hotels. The system consists of a client side and a user side allowing users to book hotels online. The first block is designed for managing hotel booking requests, hotel descriptions and prices. When a room is reserved by a user in the user side, invoices are drawn up automatically in the client side. The client receives an SMS notification. Development of hotel parsing via a partner program API. Implementation of a mechanism for translating and transliterating hotel names into Russian. A significant increase in the website's operating speed. Update of a service for discovering and posting free ads on a regional scale. The system is designed for simultaneous access by more than 1,000 users. Update of an automatic currency exchange with functionality for withdrawing money to a bank card. The system consists of a client side and a user side. The first block shows a full list of users' transactions. Exchange directions and system commissions can be managed. A user account with cumulative discounts and a referral programme is available. Vulnerabilities have been identified and eliminated. The following payment systems have been enabled: OkPay, EgoPay, Perfect Money and Bitcoin. 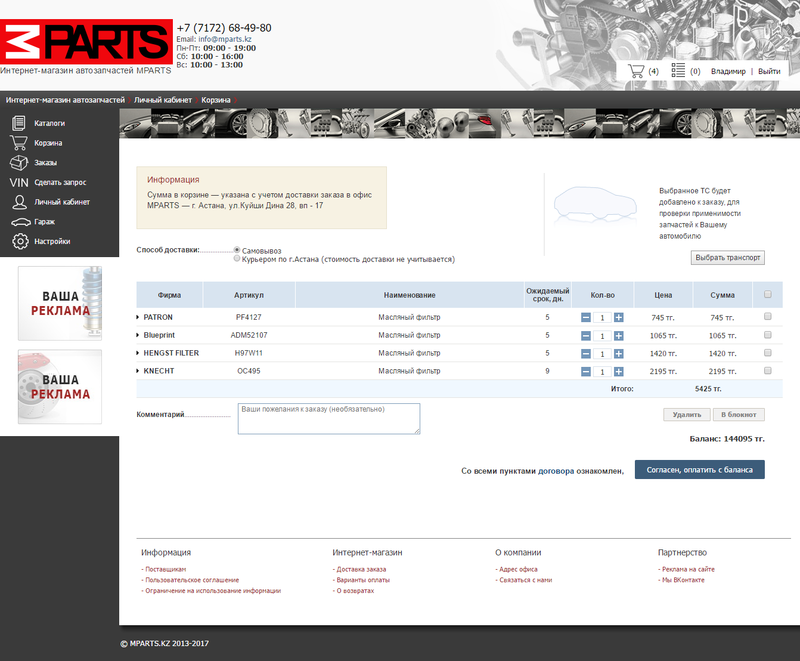 Development of an online car parts shop. Search by department for both in-house warehouses and third-party organisations has been created. A separate web service has been designed for processing queries from competitors. A function for obtaining statistical data about the shop's logistics has been implemented. An itinerary has been created for tracking the movements of parts. 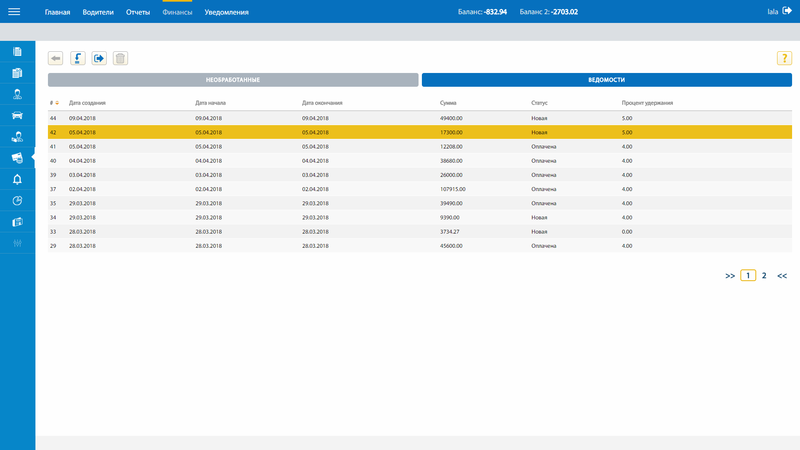 Information about the company and short financial summaries can now be uploaded. Total company balance presented in 1-ТС form in Excel with several filters (accounting data, information about local warehouses). 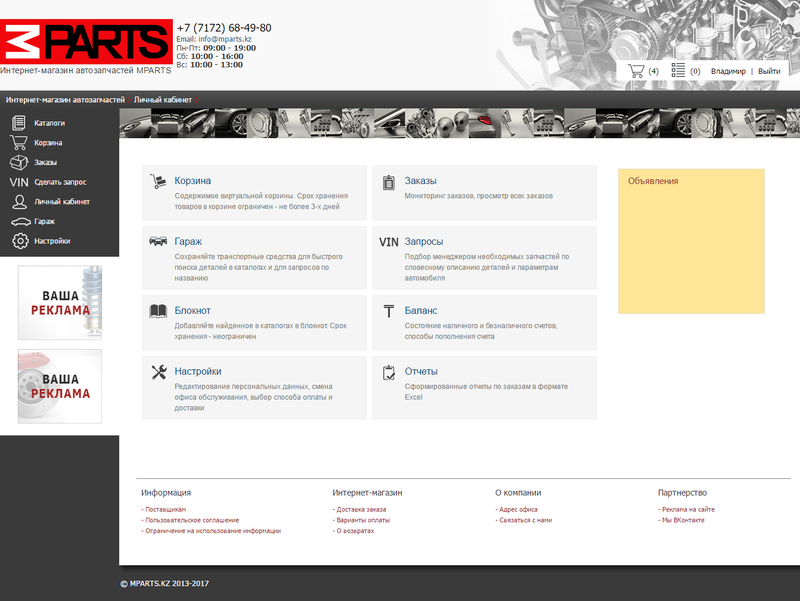 Update of the client and user sides of a site for buying and selling car parts. 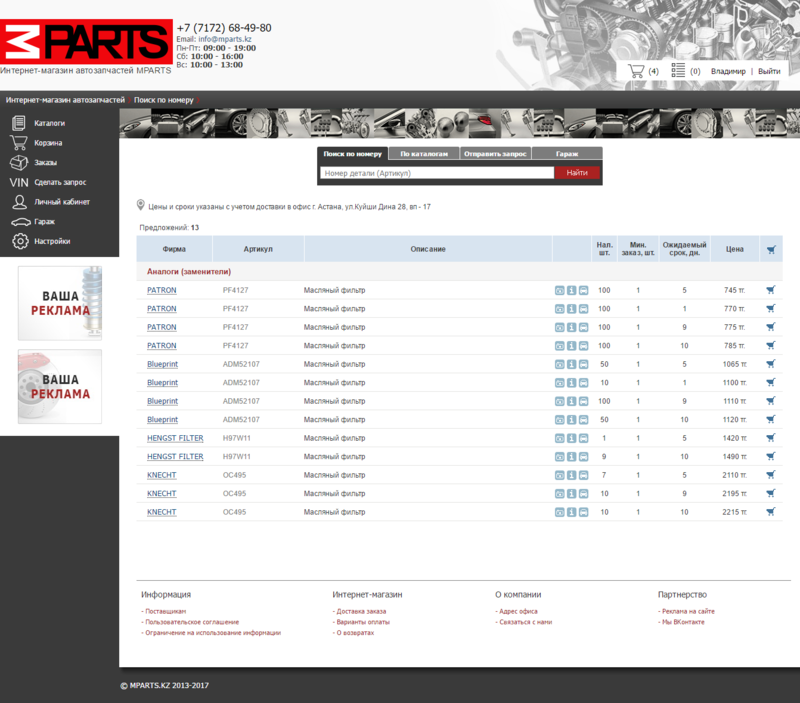 Products are searched for in the TecDoc database integrated into the site with the help of Sphinx technology. Online purchase of products is available. The client side provides for management of users, requests, goods, user discounts, and requests from users looking for parts; import of entries for goods from suppliers via Excel is provided for; extra charges are automatically added to the goods depending on the supplier's settings. Update and maintenance of a dry cleaner's website. The user side contains information about services, promotions and price lists as well as an order form. After registration a user can access their account containing personal statistics and displaying current order information and status, history, feedback forms and order forms, and registration information. CloudPayments and Yandex.Money payment system APIs are used for payments in the user account; there is an option for saving the details of several bank cards to pay with tokens or set up automated payment. 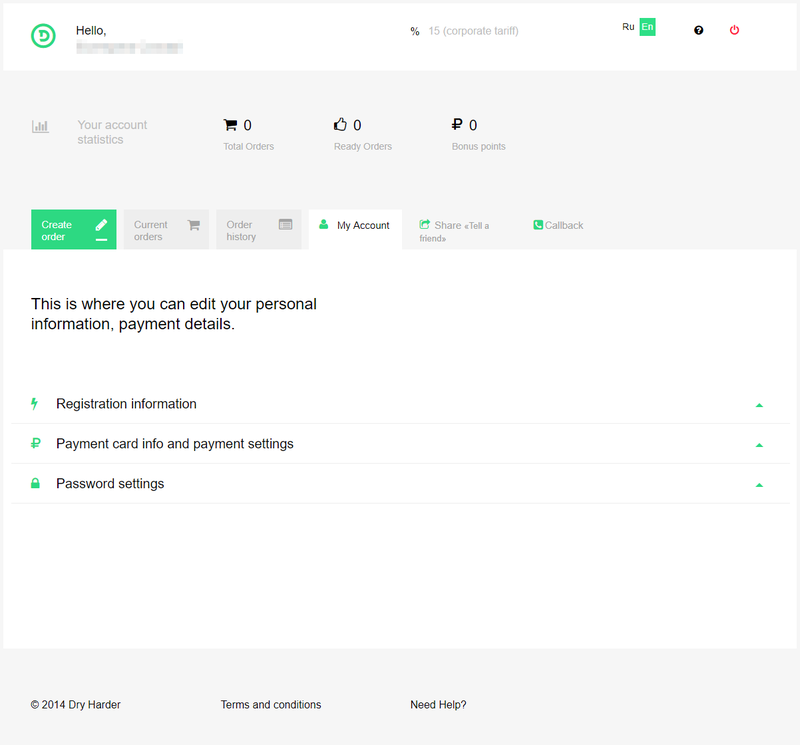 The client side includes a list of orders, feedback and a page for managing automated payments. The website functionality is closely integrated with the AGBIS dry cleaner and laundry automation program. Taxi service update to obtain an SaaS solution. 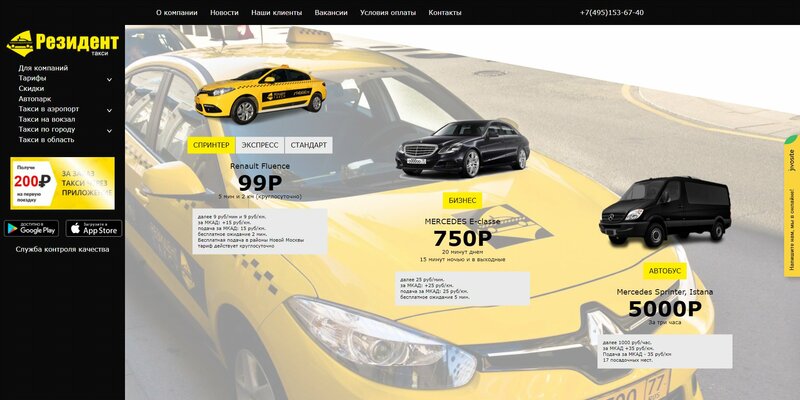 The taxi integration service consists of a web interface and a set of modules. 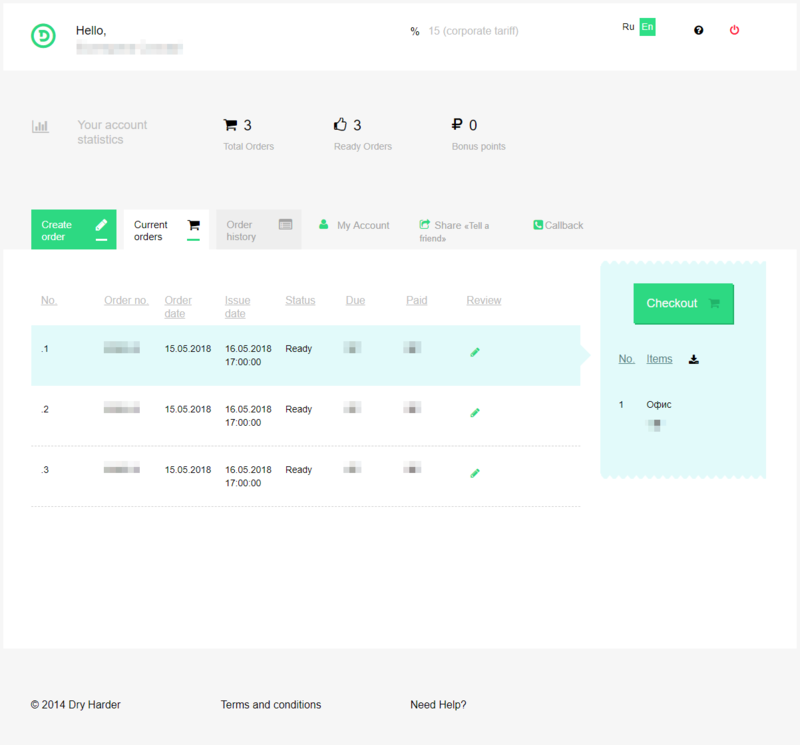 Interaction of drivers, partners and third-party aggregators is set up and organised via a web interface. 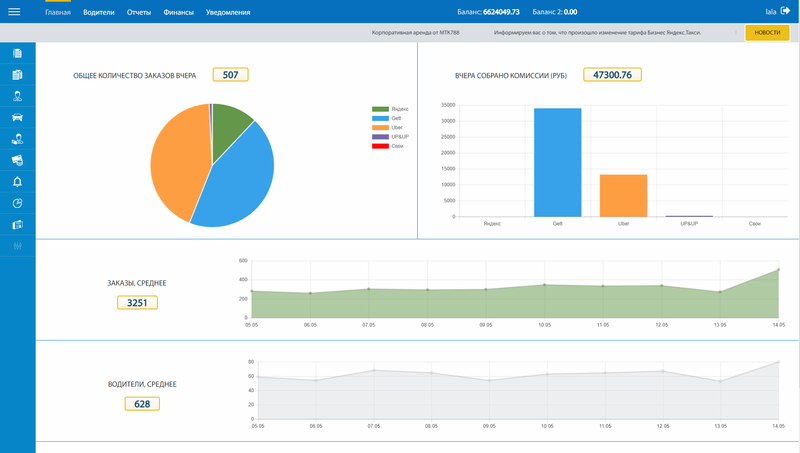 Server modules distribute between themselves the tasks of assigning and tracking orders, managing the flow of funds within the system, synchronisation with third-party aggregators, and interaction with taxi dispatchers. 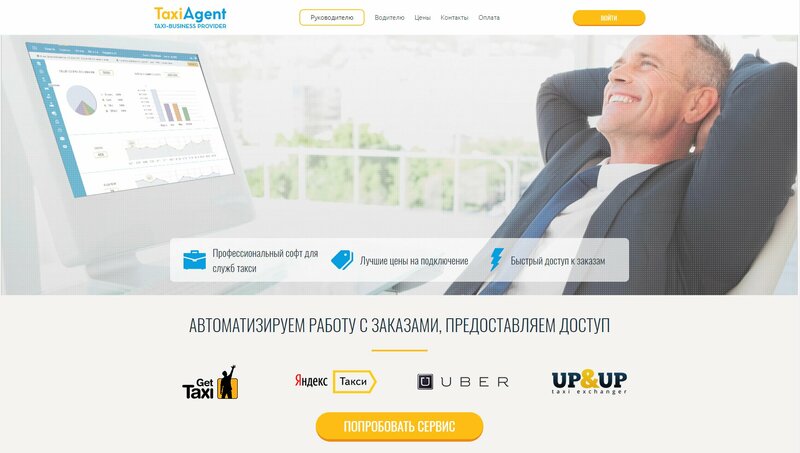 Update of the user account of a taxi service website. Order integration with taximeter: when an order is issued on the website it goes to the taximeter and can then be accepted by a driver. The administrative side enables management of users, pages, banners and other website settings. 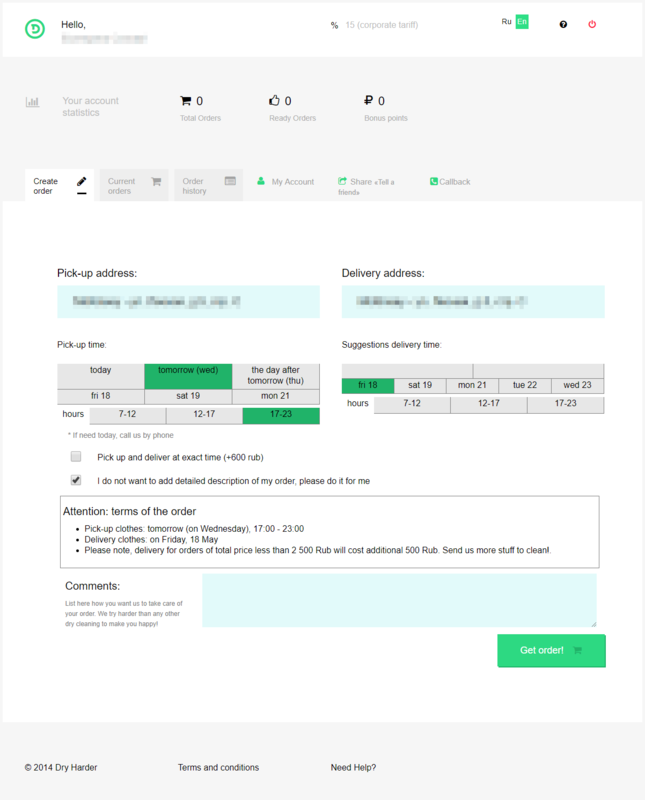 Completed orders can be exported into Excel in the user account. Taxis can be called from the website homepage, stating the pick-up point and time, and providing a phone number.